Fashion system is in flux and many are announcing it as ‘broken’ but what does this mean for design? Address contributor Jacob Rosengren considers the aesthetics of fashion during a time of transition. Fashion is known for whole-heartedly, if not blindly, embracing the new, but recently it has found itself in a situation where changes are making things feel very uneasy. One of the reasons is that some luxury brands are moving to a see-now-buy-now approach whilst others are sticking with the traditional season cycles whereby the catwalk shows take place five months before the product arrives to stores. Fashion time, that up until now has followed a fixed schedule, is becoming unstable and the industry is finding itself in an odd in-between place at the moment. As a consequence, many are announcing the fashion system as ‘broken’. With this changing notion of time, a divide is emerging between brands and how they approach design. Some, such as Anya Hindmarch, Burberry and Moschino are opting to create quick to understand and visibly strong products for instant demand. Brands like Gucci and Vetements are playing with newness – or lack thereof – by representing the same ideas season after season. On the other end of the fashion spectrum there are designers like Thom Browne, Rodarte and Marc Jacobs, immersed in the world of make-believe, creating shows that are borderline costume-y and only attractive to stylists for their fashion-as-fantasy spreads. As a consequence, there are a lot of mixed messages being transmitted in and through fashion at the moment. Nothing sums up this mood of confusion more than the second to last ensemble from Alexander McQueen’s autumn 2016 show. 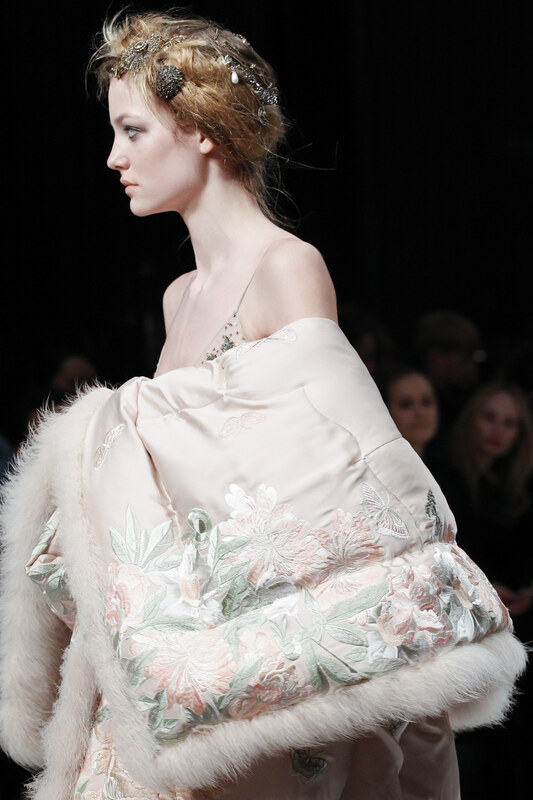 This light vintage rose eiderdown satin duvet coat, presented as part of the brand’s return to show in London, is lined with fluffy marabou and embroidered with tonal flower and butterfly motifs. Worn on top of a see-through floor-length tulle dress coated with antique-silver sequins, the puffy duvet coat appears casually draped around the frail model, falling off her shoulders as if carelessly tossed on as she emerges from her boudoir. The look radiates fashion’s uncertainty in cloth, form and encrustations. The duvet coat in itself is not a new garment and it has had many reincarnations during the last few decades. With his deconstructionist approach to fashion, Martin Margiela imagined a more paired down version for his autumn 1999 show – a style which was later reinterpreted when the label collaborated with Swedish high-street retailer H&M in 2012. 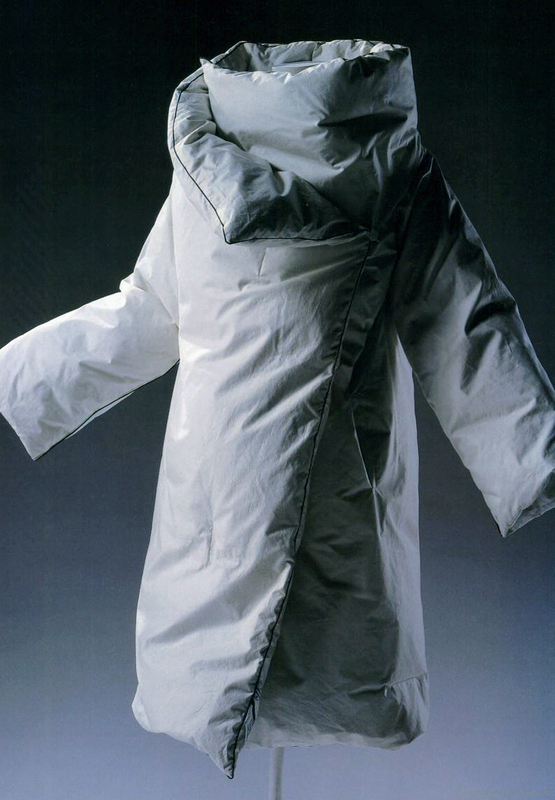 For their autumn 2005 collection, Dutch design duo Viktor Horsting and Rolf Snoeren, known for their concept-first approach to design, created a literal take on the out-of-bed overcoat, presented on the catwalk with pillows and sheets as if to prove a point. At the commercial end of the wardrobe spectrum, not a winter goes by without puffa jackets – the practical but unpleasant looking cousin of the duvet coat – appearing on the catwalks and in shops. Yet, due to its timely relevance, the McQueen version is more complex in what it represents than its previous incarnations. As if sleepwalking, the model wearing look 41 resonates the state when reality and dreams collide. On one hand, the outfit calls towards our inner laziness to do nothing and care very little with its connotations to horizontal living. Like a comfort blanket – albeit one that is overtly elaborate – the duvet coat is playing to escapism in a way that only fashion as a medium, unlike any other, allows. At the same time, the look has an aura of extravagance that responds to our need to be seen, heard and felt to validate our existence, here and now. The literal appearance of the idea leaves nothing to the imagination as it announces its reference points without hesitation. Consider the uncanny link that this look has with Surrealism that also emerged during a time of transition. Flourishing between the First and the Second World Wars, the now seminal art movement aimed to challenge rational thought with themes exploring the sub-conscious and the illogical by subverting familiar objects as a way to navigate unstable times. In the same way, this McQueen look plays with duality as a way of bridging one moment to the next whilst the industry, much in the way Europe in between the wars, re-negotiated its rules. It will take a few years for the strategic shift to take place as individual houses figure out the operative model they want to take forward and which will then contribute to the collective function of the fashion system. With that, the way in which we think and approach design will change. Perhaps look 41 provides us with a template for dealing with this moment of transition. Instead of worrying about the ‘broken’ fashion system, we should continue to allow fashion to lead our imagination whilst facing the reality that the industry needs some fundamental changes in order for the next chapter to begin. In the grand evolution of the industry, this moment will be marked as a start of something new, although the fashion is unlikely to leave a lasting impact in the history of style.